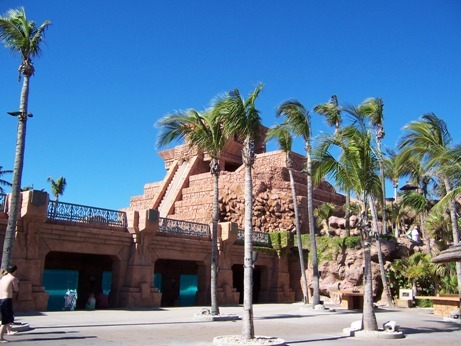 The Atlantis Mayan Temple features several waterslides, including the exhilarating sheer drop of the Leap of Faith, the fun Serpent Slide through the inside of the Temple, The twin Challenger Slides where you can race your friend, and the exotic Jungle Slide. Despite an irrational fear of heights, I've done the Leap of Faith twice. For someone with a phobia, twice is enough! 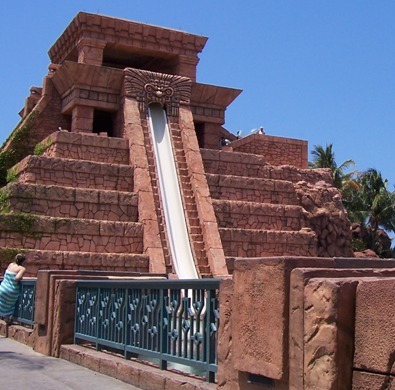 The Serpent Slide is an inner tube ride that starts near the top of the Mayan Temple. You can ride an individual tube or a double tube. I've been on this ride several times solo and once with my 9-year-old niece. Once you get to the bottom of the temple, you float out through a clear tube through a shark tank, and the sharks are swimming all around you. For kids only, try Splashers Water Rides for Kids . Adults aren’t allowed! 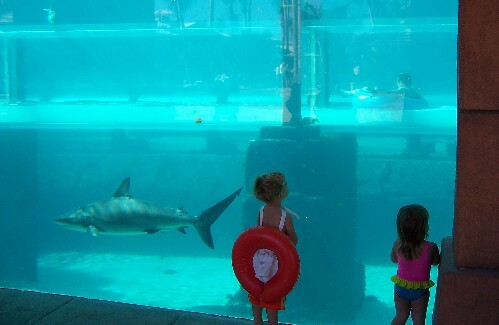 Spectators can watch the people going through the shark tank at the end of the Serpent Slide.